24 Jan : In continuation of its nationwide protests against the sky-high price rise of essential commodities, the local unit of Bharatiya Janata party organized protest march and rallies in Maloya Colony and Colony No.5. These rallies are part of the month-long agitations in which all Mandals and Districts of party will organize rallies against the Central Government for its failure to control the prices. The party activists in Maloya and Colony No. 5 organized protest march raising slogans against the Congress Government covering various parts of the colonies. At the culmination point the protest march turned into rally. Various party leaders addressed the gathering and blamed the Central Government for playing into the hands of black-marketeers. While addressing the rallies, Sh. Sanjay Tandon, President Bharatiya Janata Party Chandigarh said that the Congress party is not bothering about the poor people who are striving hard to earn even one time meal for their families. He said that the Bharatiya Janata will become voice of the people and take this agitation from ‘Mandal to Sansad’. The party is organizing agitations in January in all the Mandals and District and the state level agitation will be held on 6th February, 2010. 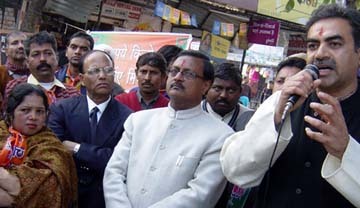 The party will also gherao Sansad in the second week of March on the issue of Price hike. Prominent party leaders who were present on the occasion and addressed the gathering include former MP Satya Pal Jain, Arun Sood, Ramesh Nikku, Santosh Mishra, Gurpreet Dhillon, Ramvir Bhatti, Sachin Lohtia, Ravi Sharma, Balwinder Gujral and Prem Kaushik and others.